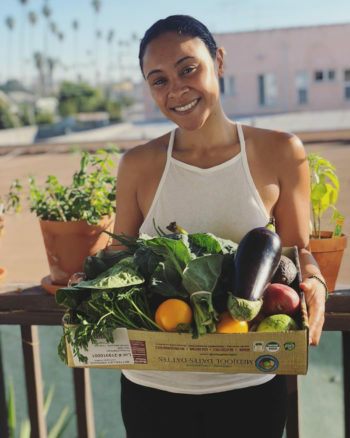 Her pop up SÜPRMARKT brings fresh food and a healthy dose of food equity to South L.A.
Olympia Auset’s mission is simple: use food to help eradicate racial inequality. SÜPRMARKT, a pop-up grocery store offering low-cost, organic foods, is her first step. The store’ colorful tables and boxes of bananas, coconuts, peppers, and greens spring up in neighborhoods around South Los Angeles, an area often ignored by larger grocery store chains. The idea is to make it “easy and affordable for people to eat well,” Auset says. But SÜPRMARKT is about more than just encouraging Angelenos to eat their fruits and vegetables. Food deserts are typically defined as areas where it’s difficult to buy basic, healthy foods including fresh fruit, vegetables, and whole milk, but the term can be controversial. Some argue it obscures the complicated web of political and financial decisions that shape neighborhoods. Shoppers at a recent SÜPRMARKT pop-up. In South L.A, as in other underserved communities, food access is tied to deep structural racism, says Mary Lee, a member of the Los Angeles Food Policy Council’s advisory board. In fact, food insecurity in South L.A. “runs parallel to white flight out of the area when enforced legal segregation ended,” she says. “There’s a lot of food there, but it’s not good for you,” she says. Instead of grocery stores, the area is filled with liquor stores and fast food restaurants. South L.A. is home to 1.3 million people, a majority of whom are Latinx and African American. But despite the large population, the area only has 60 grocery stores. In comparison, the more affluent and white West Los Angeles, which has fewer than half as many residents, boasts 57. That disparity in access to basic foods has translated into drastically different health outcomes for the areas residents. The obesity rate in South L.A. is triple the rate of its western neighbors and the life expectancy for residents is nearly 10 years lower than that of residents in wealthier neighborhoods like Santa Monica. “People are dying because of the food they have available to them,” Auset says. SÜPRMARKT wants to change that narrative. Of course, making healthy food choices isn’t always easy. Like many city-dwelling Americans, when Auset returned home after college, she found herself spending a lot of time on the bus just to buy food. It took hours to get from her apartment near Inglewood to the natural grocery store in Santa Monica and back. When she did get there, she found that basic vegetables and $16-per-pound almonds and cashews were too expensive. The idea for SÜPRMARKT grew out of those basic, daily struggles. In July of 2016, Auset started SÜPRMARKT, and began employing a number of strategies to keep costs low. She sources directly from farms, buys wholesale, and offers seconds that would otherwise be thrown away. As the only full-time employee, she relies on three part-time staffers and a roster of 20 volunteers to help run events and deliver boxes. 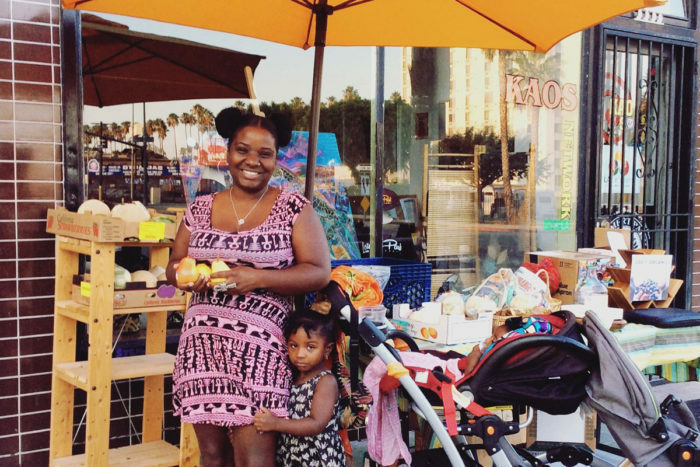 Instead of paying for real estate, SÜPRMARKT pops up once or twice a month at parks and community centers in places such as West Adams, Leimert Park, and the Crenshaw YMCA. Auset uses her website and social media sites to let followers know where she sets up. She also offers a weekly produce delivery service starting at $100 a month—or around the same price as a subscription to Imperfect Produce. Justen LeRoy, community outreach coordinator at The Underground Museum, a nonprofit arts space that often hosts SÜPRMARKT events, said that “no option for fresh produce for miles” around the museum. But he also points out that fixing food deserts is not as simple as plopping a grocery store into a neighborhood. But Auset knows she needs to find a way to pay herself and her three-person staff. While SÜPRMARKT does break even, this year, members of their team launched a 501(c)3 nonprofit called SÜPRSEED. Auset hopes that grants and donations to SÜPRSEED will help underwrite the cost of food at SÜPRMARKT, ensuring they can keep prices down. She also has plans to expand. Around the country, there are numerous examples to help guide Auset in her efforts. In Brooklyn, Flint, Kansas City, and around the country, people and organizations are working to improve access to healthy food at the neighborhood level. In Los Angeles, organizations like the L.A. Food Policy Council are also working with the city to create loans and financial incentives that make it more attractive for grocery stores to open in South L.A. They’re also working with existing corner stores to make it easier for them buy produce in bulk and sell it at competitive prices. 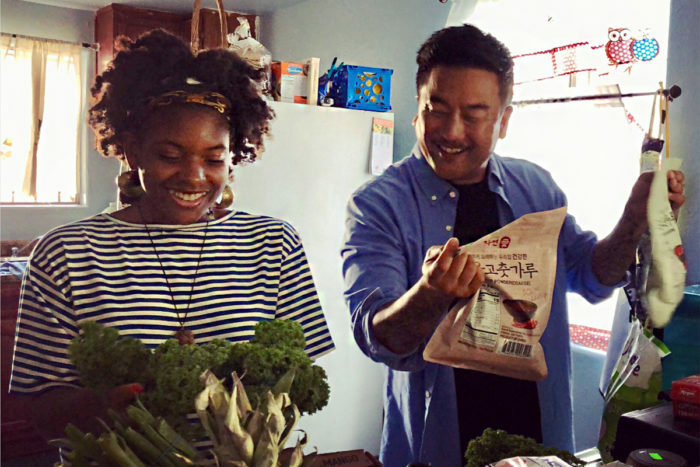 Olympia Auset cooks with Chef Roy Choi as part of Choi’s “Broken Bread” television program. Down the road, Auset hopes to offer cooking demos, workshops, online video classes, and more. And she says she has already gotten calls from people across the country asking her to help them start similar efforts. She also has big goals when it comes to ending food deserts across the country. But for the foreseeable future, this social entrepreneur is focused on testing out strategies locally. 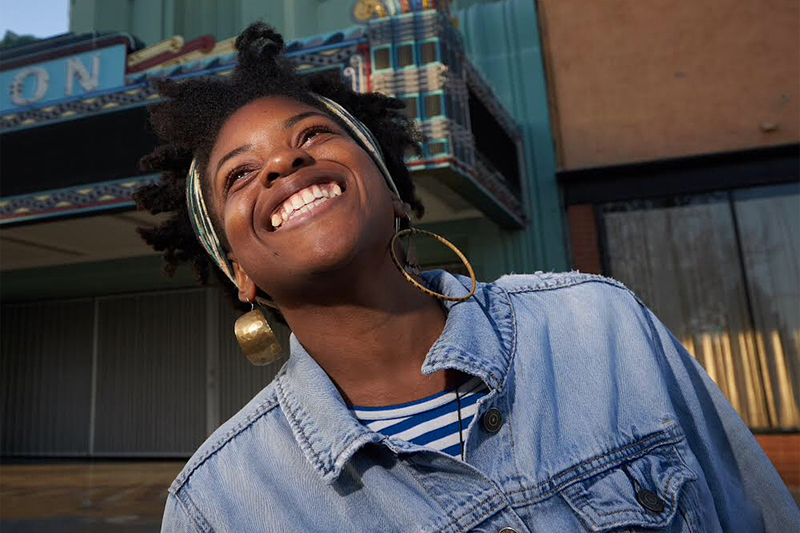 Despite decades of entrenched injustice in the food system there, she believes that South LA is the perfect testing ground. She points out that California grows over one-third of the nation’s vegetables and over 65 percent of its fruit and nuts. “If we can end food deserts anywhere, it’s here,” she says. This article was updated on October 3 to include details about the new SÜPRSEED nonprofit Auset has started. Great work, I would like to know how I can volunteer. Congratulations Olympia- you are a visionary problem- solver. This is a wonderful service which not only identified a disparity but developed a business to address a problem. Consider a Kiva loan for future funding- Lifting one, to lift many--www.kiva.org.